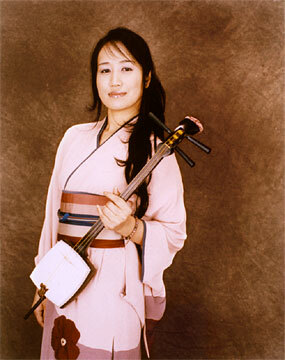 Michiko Wakabayashi is a kokyu (traditional Japanese fiddle) player who was born in Tokyo, Japan. She was raised listening to her grandfather play the kokyu and later became interested in the instrument herself. She has developed a unique way of playing “Wakabayashi-ryu (style)” after her name. She is now a kokyu instructor of ‘Ecchu Owara Bushi’ and other traditional numbers. As she considers ‘Owara Kaze no Bon Festival’(9/1~3) as the origin of her performance, the motto of her solo activities is to ‘express the sounds of the grand universe in natural ways.’ She chose ‘Souru,’ a style that honors and takes the melodies of Ecchu Owara Bushi into its sweet and peaceful melodies, as the theme of her activities. She created a group named “Aria” in October, 2001 to expand the potentials and horizons of various expressions by kokyu and created many original songs.